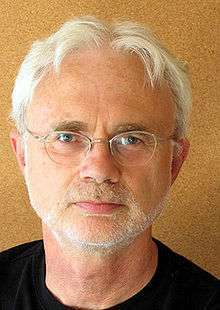 John Coolidge Adams (born February 15, 1947) is an American composer of classical music and opera, with strong roots in minimalism. His works include Harmonielehre (1985), Short Ride in a Fast Machine (1986), On the Transmigration of Souls (2002), a choral piece commemorating the victims of the September 11, 2001 attacks (for which he won the Pulitzer Prize for Music in 2003), and Shaker Loops (1978), a minimalist four-movement work for strings. His operas include Nixon in China (1987), which recounts Richard Nixon's 1972 visit to China, and Doctor Atomic (2005), which covers Robert Oppenheimer, the Manhattan Project, and the building of the first atomic bomb. The Death of Klinghoffer is an opera for which he wrote the music, based on the hijacking of the passenger liner Achille Lauro by the Palestine Liberation Front in 1985, and the hijackers' murder of wheelchair-bound 69-year-old Jewish-American passenger Leon Klinghoffer. The opera has drawn controversy, including allegations by some (including Klinghoffer's two daughters) that the opera is antisemitic and glorifies terrorism. The work's creators and others have disputed these criticisms. Adams began composing at the age of ten and first heard his music performed around the age of 13 or 14. After he matriculated at Harvard University in 1965 he studied composition under Leon Kirchner, Roger Sessions, Earl Kim, and David Del Tredici. He earned two degrees from Harvard University (BA 1969, MA 1972). His piece "American Standard" was recorded and released on Obscure Records in 1975. He taught at the San Francisco Conservatory of Music from 1972 until 1984. He served as musical producer for a number of series for the Public Broadcasting System including the award-winning series, The Adams Chronicles in 1976 and 1977. Shaker Loops (for string septet) (1978): A "modular" composition for three violins, one viola, two cellos, and one bass, with a conductor. It is divided into four movements. Harmonium for large orchestra and chorus (1980–81): The piece starts with quietly insistent repetitions of one note – D – and one syllable – "no". Grand Pianola Music (1982): Adams commented, "Dueling pianos, cooing sirens, Valhalla brass, thwacking bass drums, gospel triads, and a Niagara of cascading flat keys all learned to cohabit as I wrote the piece." Light Over Water: The Genesis of Music (1983): This work was commissioned by the Museum of Contemporary Art in Los Angeles as the score for the collaborative work Available Light, which was choreographed by Lucinda Childs and had a set design by architect Frank Gehry. Harmonielehre (1984–85): Inspired by a dream of an oil tanker taking flight out of San Francisco Bay and also by Arnold Schoenberg's book, Harmonielehre (Theory of Harmony). This piece is also about harmony of the mind. The Chairman Dances (Foxtrot for Orchestra) (1985): This is a by-product of Nixon in China, set in the three days of President Nixon's visit to Beijing in February 1972. Short Ride in a Fast Machine (Fanfare for Great Woods) (1986): This piece is joyfully exuberant, brilliantly scored for a large orchestra. It begins with a marking of half-notes (woodblock, soon joined by the four trumpets) and eighths (clarinets and synthesizers); the (amplified) woodblock is fortissimo and the other instruments play forte. Nixon in China (1987): The opera, in three acts, is based on Richard Nixon's visit to China on February 21–25, 1972. Main characters in the opera are: the Nixons, Mao Tse-tung, Chou En-lai, Chiang Ch'ing (Madame Mao) and Henry Kissinger. Richard Nixon's visit to Beijing was made in the hope, but by no means the certainty, that he would see chairman Mao. It was directed by Peter Sellars. This piece is John Adams's second major composition on a text, after Harmonium (1981) for chorus and orchestra. The Wound-Dresser (1988): John Adams's setting of Walt Whitman's 1865 poem of the same title, which Whitman wrote after visiting wounded soldiers during the American Civil War. The piece is scored for baritone voice, 2 flutes (or 2 piccolos), 2 oboes, clarinet, bass clarinet, 2 bassoons, 2 horns, trumpet (or piccolo tpt), timpani, synthesizer, and strings. A Flowering Tree (2006): An opera in two acts, based on a folktale from the Kannada language of southern India as translated by A.K. Ramanujan. it was commissioned as part of the Vienna New Crowned Hope Festival to celebrate the 250th anniversary of Mozart’s birth. On March 26, 2015, before the premier of Scheherazade.2 by the New York Philharmonic, Adams introduced the setting of the piece as related to One Thousand and One Nights, in which Scheherazade, after being forced into marriage, by recounting tales to her husband, delays her death. He associated modern examples of suffering and injustice towards women around the world, with acts in Tahrir Square during the Egyptian Revolution of 2011, Kabul, and comments from the The Rush Limbaugh Show. Violin Concerto, Mvt. III "Toccare"
The most critically divisive pieces in Adams's collection are his historical operas. While it is now easy to say that Nixon in China's influential score spawned a new interest in opera, it was not always met with such laudatory and generous reviews. At first release, Nixon in China received mostly mixed if not negative press feedback. Donal Henahan, special to the New York Times, called the Houston Grand Opera world premiere of the work "worth a few giggles but hardly a strong candidate for the standard repertory" and "visually striking but coy and insubstantial." James Wierzbicki for the St. Louis Post-Dispatch described Adams's score as the weak point in an otherwise well-staged performance, noting the music as "inappropriately placid," "cliché-ridden in the abstract" and "[trafficked] heavily in Adams's worn-out Minimalist clichés." With time, however, the opera has come to be revered as a great and influential production. Robert Hugill for Music and Vision called the production "astonishing ... nearly twenty years after its premier," while City Beat's Tom McElfresh called Nixon's score "a character in the drama" and "too intricate, too detailed to qualify as minimalist." 2003's The Dharma at Big Sur/ My Father Knew Charles Ives was well-received, particularly at Adams's alma mater's publication, the Harvard Crimson. In a four-star review, Harvard's newspaper called the electric violin and orchestral concerto "Adams's best composition of the past ten years." Most recently, New York Times writer Anthony Tommasini commended Adams for his work conducting the American Composers Orchestra. The concert, which took place in April 2007 at Carnegie Hall, was a celebratory performance of Adams's work on his sixtieth birthday. Tommasini called Adams a "skilled and dynamic conductor," and noted that the music "was gravely beautiful yet restless." After the September 11 attacks in 2001, performances by the Boston Symphony Orchestra of excerpts from Klinghoffer were canceled. BSO Managing Director Mark Volpe remarked of the decision: "We originally programmed the choruses from John Adams’ The Death of Klinghoffer because we believe in it as a work of art, and we still hold that conviction. ... [Tanglewood Festival Chorus members] explained that it was a purely human reason, and that it wasn’t in the least bit a criticism of the work." Adams and Klinghoffer librettist Alice Goodman criticized the decision, and Adams rejected a request to substitute a performance of Harmonium, saying: "The reason that I asked them not to do 'Harmonium' was that I felt that 'Klinghoffer' is a serious and humane work, and it's also a work about which many people have made prejudicial judgments without even hearing it. I felt that if I said, 'OK, "Klinghoffer" is too hot to handle, do "Harmonium,"' that in a sense I would be agreeing with the judgment about 'Klinghoffer.'" In response to an article by San Francisco Chronicle David Wiegand denouncing the BSO decision, musicologist and critic Richard Taruskin accused the work of catering to "anti-American, anti-Semitic and anti-bourgeois" prejudices. A 2014 revival by the Metropolitan Opera reignited debate. Former New York City mayor Rudy Giuliani, who marched in protest against the production, wrote: "this work is both a distortion of history and helped, in some ways, to foster a three decade long feckless policy of creating a moral equivalency between the Palestinian Authority, a corrupt terrorist organization, and the state of Israel, a democracy ruled by law." Current mayor Bill de Blasio criticized Giuliani's participation in the protests, and Oskar Eustis, the artistic director of the Public Theater said in support of the production: "It is not only permissible for the Met to do this piece – it's required for the Met to do the piece. It is a powerful and important opera." A week after watching a Met performance of the opera, Supreme Court Justice Ruth Bader Ginsburg said "There was nothing anti-Semitic about the opera," and characterized the portrayal of the Klinghoffers as "very strong, very brave", and the terrorists as "bullies and irrational". (2017) Girls of the Golden West (to be premiered by San Francisco Opera, November 2017). ↑ Cooper, Michael. "Klinghoffer Protesters Flock to Met Opera House". The New York Times. Retrieved October 20, 2014. ↑ "Concord high school notables". Concord High School. Retrieved December 17, 2013. ↑ Adams, John. Program Note, Grand Pianola Music Full Score, Associated Music Publishers, 1982. ↑ Kisselgoff, Anna (October 29, 1983). "Dance: In Brooklyn, Premiere of 'Available Light'". The New York Times. Retrieved July 31, 2016. ↑ Adams, John (1987). "Nixon in China". Boosey & Hawkes. Retrieved July 31, 2016. ↑ Thorpe, Vanessa. "I'm Blacklisted, says Opera Maestro: Composer John Adams Accuses US of Paranoia and Says its Security Forces are Following Him." The Observer. October 19, 2008. . Retrieved February 10, 2009. ↑ Adams, John (1992). "Chamber Symphony". Boosey & Hawkes. Retrieved July 31, 2016. 1 2 3 "Music". Pultizer.org. Retrieved September 22, 2014. ↑ Adams, John (2003). "My Father Knew Charles Ives". Boosey & Hawkes. Retrieved July 31, 2016. ↑ Kosman, Joshua (May 2, 2003). "Symphony premieres Adams' splendid 'Ives' / A funny and touching musical memoir". San Francisco Chronicle. Retrieved July 31, 2016. ↑ "Petrushka and the World Premiere of John Adams's Scheherazade.2". Nyphil.org. Retrieved 2015-10-24. ↑ Anthony Tommasini (March 27, 2015). "Review: John Adams Unveils 'Scheherazade.2,' an Answer to Male Brutality". Retrieved April 4, 2015. ↑ Zoe Madonna (March 27, 2015). "Violinist Josefowicz Shines in a Modern Scheherazade". Retrieved April 4, 2015. ↑ Jay Nordlinger (March 26, 2015). "A Sick and Twisted Culture". Retrieved April 4, 2015. ↑ "John Adams on Harmonium". Earbox.xom. Retrieved September 22, 2014. ↑ Thomas May, pp. 7–10. ↑ K. Robert Schwarz, Minimalists, p. 175. ↑ K. Robert Schwarz, Minimalists. ↑ Jonathan W. Bernard, "Minimalism, Postminimalism, and the Resurgence of Tonality in Recent American Music" Journal of American Music, Spring 2003, Vol. 21, No. 1, pp. 112–33. ↑ Stayton, Richard (June 16, 1991). "The Trickster of Modern Music : Composer John Adams Keeps Reinventing Himself, to Wilder and Wilder Applause". Los Angeles Times. Retrieved July 31, 2016. ↑ Heisinger, Brent. "American Minimalism in the 1980s." American Music. Winter 1989. . Retrieved February 10, 2009. ↑ "Long Ride in a Stalled Machine.". Thestandingroom.com. Retrieved September 22, 2014. ↑ Kozinn, Allan. "Beyond Minimalism: The Later Works of John Adams." New York Times. March 23, 2005 . Retrieved February 11, 2009. ↑ Henahan, Donal. "Opera: Nixon in China." The New York Times. October 24, 1987 . Retrieved February 11, 2009. ↑ Hugill, Robert. "Ensemble: A Mythic Story: Nixon in China." Music & Vision. July 2, 2006. ↑ McElfresh, Tom. "Nixon in China: John Adams' Score Highlights Marvelous Production." City Beat (Cincinnati). July 14, 2007. . Retrieved February 11, 2009. ↑ Lin, Eric W. "CD Review: John Adams, The Dharma at Big Sur/ My Father Knew Charles Ives. The Harvard Crimson. October 19, 2006. . Retrieved February 11, 2009. ↑ Tommasini, Anthony. "Doing Everything but Playing the Music." The New York Times. April 30, 2007 . Retrieved February 11, 2009. ↑ Kozinn, Allan (September 11, 1991). "Klinghoffer Daughters Protest Opera". New York Times. Retrieved 8 February 2016. ↑ Cummings, Conrad (September 27, 1991). "What the Opera 'Klinghoffer' Achieves". Retrieved 8 February 2016. ↑ Sheldon, Molly. Music America Needs Now NewMusicBox. December 1, 2001. ↑ "Rudy Giuliani: Why I Protested The Death of Klinghoffer". The Daily Beast. Retrieved October 21, 2014. ↑ "Protests Greet Metropolitan Opera's Premiere of Klinghoffer". Retrieved October 21, 2014. ↑ Bravin, Jess. On ‘The Death of Klinghoffer,’ Justice Ginsburg Finds for the Defense Wall Street Journal. October 28, 2014. ↑ "Book of Members, 1780–2010: Chapter A" (PDF). American Academy of Arts and Sciences. Retrieved April 1, 2011. ↑ "Current Members". American Association of Arts and Letters. Retrieved April 1, 2011. ↑ "Harvard Arts medal". Thecrimson.como. Retrieved September 22, 2014. ↑ "Eight receive honorary degrees". Harvard News Office. Retrieved May 24, 2012. ↑ MacNamara, Mark. "Samuel Adams' Big Break". 2010. San Francisco Classical Voice. Retrieved September 6, 2013. "John Adams material". BBC Radio 3 archives. John Adams (January 1, 2001). "In the Center of American Music". NewMusicBox (Interview). Interview with Frank J. Oteri on November 11, 2000.